Campaigns planned on more than 50 campuses. BOSTON — Environment America, along with students across the country, will launch 50 campaigns in 15 states this year, imploring colleges and universities to generate 100 percent of their energy from renewable sources. The nationwide initiative will include educational forums, petition drives and direct engagement with administration officials to press for 100 percent renewable energy on campuses. 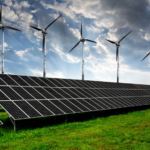 In support of these efforts, more than 950 faculty and campus leaders have signed a statement calling for higher education administrators to make a clear commitment to achieve 100 percent renewable energy for all operations. Read more here. The following is a Viewpoint from Senior Policy Advisor for Energy Grant Smith and Vice President and Editor-in-Chief Bill Walker at the Environmental Working Group. The Beautiful Beach Town of Santa Monica Powers With 100% Renewable Energy, Thrive Global. Learn more about Santa Monica, California’s impressive sustainable plan, including clean energy, public transportation, micro mobility, organic food, water conservation and a ban on plastic. Interview with former Santa Monica Mayor Ted Winterer. The Climate Group. Parent company Anheuser-Busch, the world’s largest brewer, is a member of RE100, a corporate leadership initiative on 100% renewable electricity led by The Climate Group in partnership with CDP. Watch the popular commercial here. Ocasio-Cortez has succeeded in generating enthusiasm for a Green New Deal — 92% of Democrats and 64% of Republicans support such a plan, according to one survey. 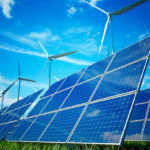 This entry was posted in NewsBlog and tagged 100% renewable energy, businesses transitioning to 100% renewables, CDP, cities and states transitioning to 100% renewables, colleges and universities transitioning to 100% renewable energy, Environment America, Environment America's 100% renewable energy initiatives, Environmental Working Group, Green New Deal, RE100, states' distributed solar policy actions, The Climate Group on February 1, 2019 by Helen Deffenbacher.